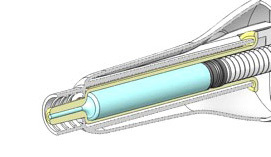 Example: Pre-filled Preciquant™ Injector for drugs with luer needle system. Device is filled by the veterinary for an « at home use ». Injector if mounted with a needle. Examples: treatments and medicine delivery. The device can either be delivered in bulk, assembled, filled, packed, boxed, clean or sterile. The manufacturing, filling, assembly and packaging can be made by Primequal, a sub-contractor of the customer or by the customer himself based on a license. Primequal can process the device in ISO clean rooms (8,7,5) and through multiple sterilization technology.